For the second straight year the New York Yankees have been active on the trade market prior to the end of July trade deadline. Unlike last year, the Yankees are participating on the buying side of things for 2017. Fans of the sport can’t say they expected this Yankees team to be in the situation they are in now. A team that is well suited for the next coming years with young talent but is competing at just a high enough level now makes one question what can this season really yield for the Bronx Bombers? The year started off hot in the first 30 games gong 21-9 but then things cooled off very quickly only going 10-20 in the last 30 games. Today the bombers sit 2.5 games behind the first place Red Sox in the AL East and it appears the front office believes a playoff run is a very possible achievement. During the Yankees slide during the latter portion of the first half of the season, the bullpen became an increasing issue for a team that had been touted as having one of the top bullpens backed by the likes of Dellin Betances and Aroldis Chapman. Sadly, when your two best relievers hit the bumpy road things begin to fall from underneath. Now, after the All-Star break, the bullpen seems to be regaining its strength; still some walks here and there but for the most part runners are not crossing home plate in the late innings like they were pre All-Star break. Then the Yankees go out and acquire two more power bullpen arms in David Robertson and Tommy Kahnle, both of whom are ex Yankees. Chance Adams has absolutely dominated AAA hitters this year giving up only 35 hits in his 62.1 innings pitched which reflects in his 0.98 WHIP on the season. Adams touts a four pitch arsenal. His fastball has late life and command across the zone that sits around 94 on average and will top out around 98. Similarly to Gray, his best pitch is his breaking pitch. While Gray throws a sort of slider curve ball hybrid with 1 to 7 break, Adams relies on a nasty 12-6 curve ball that he will throw at any point in an at bat. Adams has also developed a plus slider in his more recent years that has begun to develop into something he can take advantage of with its late break to generate swing and misses. Finally, his change-up is a pitch he’s been working hard to improve and has shown plus pitch potential this year, however, going forward it’s the biggest question mark for him and will be a must have pitch at the MLB level. The scouting reports between Gray and Adams as they both were rising through the MiLB levels are very similar. Strong FB, a nasty breaking ball, and a change-up that needs work. Granted, Gray has the MLB experience that Adams does not, but every player has to start somewhere and Gray’s 2016 MLB season was not anything to write home about. Following the loss of Michael Pineda, the question marks around the Yankees rotation became even more relevant than one could imagine at this point. 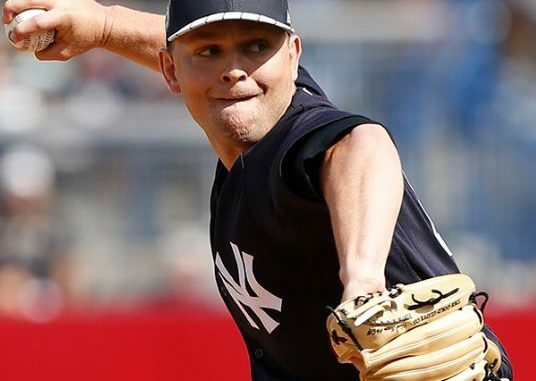 Cashman was asked his thoughts on Adams getting a chance at the big league level following the report on Pineda’s injury and his response was that he is being considered to fill the rotation spot. While I don’t necessarily agree with Girardi’s sentiment, I can see the point he is trying to make. Adams is still only 22 years old and this is his first year at the AAA level. The question then also arises of what corresponding move do the Yankees make to shore up room on the 40 man roster to add Chance to it. So there definitely are some logistical issues to iron out in order to call the young starter up to the bigs prior to roster expansion come September. With that said, the Yankees have lived through the Cessa/Mitchell experiments long enough. It’s quite clear these guys do not have staying power in an MLB rotation and the Yankees are in dire need of exactly that. Trading for a guy like Sonny Gray is going to come at a premium, his friendly contract will ensure that. Why continue to over think if guys are perfectly ready or not and look at the results they have shown. Clint Frazier was considered to be called up too early as well. In a very small sample size he is giving the Yankees a reason to make sure he gets in the lineup. Chance deserves the same opportunity. The Yankees have an opportunity to hold onto other major assets and upgrade from within. Adams has the potential to be a #3 starter in the bigs, which is exactly what the Yankees need so desperately right now. For those readers who are fantasy baseball players, Adams will surely make an appearance at the big league level in 2017; the only remaining question is exactly when it will come. If you’re in a dynasty league and he happens to be available, jump on him now. For deeper redraft or keeper leagues that have space for a stash, he’s worth a flyer. Prior to Cessa’s start last night, Girardi stated Cessa would be getting another start this weekend. It would not surprise me if things see a shake up and Chance Adams gets his first big league start instead.